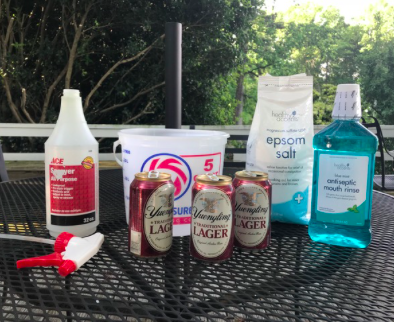 Home Recipes	Homemade Bug Spray! Happy Tuesday, my friends! I hope you had a wonderful holiday weekend. We took time for a bit of fun but of course Brad, (my husband) kept busy with a few chores around the house. His favorite new concoction? Homemade Bug Spray! On the last trip to the lake Brad decided to take matters into his own hands. He found a homemade bug spray to combat the problem. This is a great solution in several ways. First and foremost the ingredients are natural and safe for Lacey. The mixture dries quickly and is non-toxic to animals. (Naturally you don’t want your pet to drink or lick the solution as you would guess). Also, it contains items found at the grocery store for little money. Brad sprayed several large spider webs today and said the spiders scattered like crazy. I’m not sure what it is about this combination of ingredients that works but it seems to work well, especially for ants and spiders. We even sprayed the bushes and trees around the deck hoping to kill mosquitoes as well. TIP: Brad says he opens the beer cans the night before he makes the bug spray in order to let it go flat. He also recommends removing the spider webs prior to spraying. Housing update? We close in 3 short days! Lots of last-minute activities such as a final walk through and arranging movers and family members to help us on closing day. We are praying for this storm front to pass so it will be nice and dry on moving day. Fingers crossed!